It has become common practice in reconstructive surgery to transpose or transplant a variety of autologous tissues to fill defects at a recipient site. Using muscle tissue, it becomes possible to dynamically assist or replace an impaired or lost function. For these procedures the term ‘dynamic myoplasty’ is generally used. In dynamic myoplasty, control of timing and rate of contraction of the transposed or transplanted muscle tissue is substantial, but presently not fully within reach. Currently used electrical stimulation protocols, which stimulate innervating nerves or the muscle tissue itself, supply gross on-off spasm-like contractions of the whole dynamic myoplasty muscle. This leads to rapid fatigue, which can be partly overcome using training protocols converting the dynamic myoplasty into a more fatigue resistant state at the cost of strength and responsiveness. Furthermore ischemic lesions, fibrotic changes and abundant scarring due to constant high tissue pressures are widespread reported in these procedures. This thesis reports on efforts to gain more control over dynamic myoplasties, in order to overcome some of the drawbacks of currently used electrical stimulation on one hand, and to give rise to more refined applications of dynamic myoplasties on the other. Conventional stimulation techniques recruit all or most of the muscle fibers simultaneously and continuously. Therefore, sequential segmental neuromuscular stimulation was introduced, in which only segments of the transferred muscle tissue are stimulated in a sequential fashion, providing continuous work, but with alternating partitions. This way, the temporary resting segments are reperfused during functioning of the dynamic myoplasty. The muscles studied were the canine gracilis and all experiments were acute studies in anesthetized animals. Comparison of sequential and conventional stimulation revealed the predicted increase in muscle fatigue resistance and muscle blood flow. These effects were more pronounced in the isometric setup with stretched out and fixed gracilis muscles reported in chapter 2, than in a non-isometric setup with gracilis based neo-sphincters, which were allowed to shorten during stimulation, as described in chapter 3. The shortening of the muscle tissue and Summary 3 kinking of the intra-muscular blood vessels within the neo-sphincters could be a reason for the less distinct increase of perfusion and subsequent fatigue resistance during non-isometric contractions. Apart from improving perfusion, reducing the load of the dynamic myoplasty will improve its endurance as well. Furthermore, it is likely that reducing the load will decrease ischemia, leading to less fibrotic changes and subsequent scarring of the involved tissues. 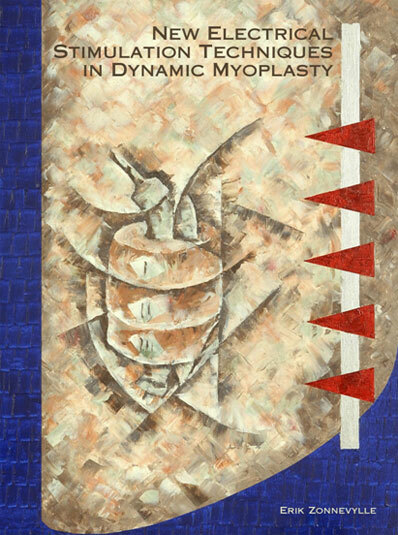 To economize the load of the dynamic myoplasty to exact (and changing) needs, control over the contraction rate of the muscle tissue needs to be precise. Closed-loop control proved to be a good cybernetic tool to regulate the pressures generated by gracilis based sequentially stimulated neo-sphincters in an acute dog study as was elucidated in chapter 4. The inherent problem in closed-loop control of oscillations was successfully reduced to less than 10% of the target-pressures by using optimized correction frequencies, correction thresholds and transition times. Modulation of the stimulation amplitudes proved to be superior over modulation of the stimulation frequency in order to tune the performance of the neo-sphincters. Having increased fatigue resistance and being able to precisely control the rate of performance, a dynamic myoplasty should be able to perform more complex tasks. Therefore, an acute dog study was designed in which gracilis based neo-sphincters were made to maintain a pressure gradient with the bladder during fast and slowly changing bladder pressures, using a combination of sequential stimulation, closed-loop control and a function-controlling algorithm. Results, set out in chapter 5, showed that the neo-sphincter was able to maintain the desired pressure gradient with the bladder during fast and slowly changing bladder pressures. Accuracy showed no significant difference when compared to the native sphincter, which served as control. Addition of a simplified self-learning component in the algorithm, adapting the duty cycle of individual segments to their relative state of fatigue, proved feasible and meaningful in this study design. Overall this thesis reports improvement in fatigue resistance and control over a dynamic myoplasty using sequential stimulation, closed-loop control and function-controlling algorithms in acute studies. A comparable implantable New electrical stimulation techniques in dynamic myoplasty system, can be used in chronic studies. Availability of this implantable system should be able to confirm the lesser need for muscle fiber type transformation, using training regimens, and also reveal other benefits as prevention of ischemic lesions, fibrotic changes and abundant scar formation. All these improvements should offer more versatile dynamic myoplasties, broadening the abilities of reconstructive surgeons in the repair of functional defects.